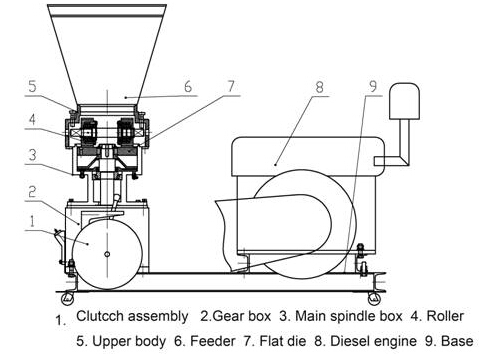 Diesel feed pellet mill is flat-die designed. It is more favored by pellets makers in the areas where electric is expensive or not available. It can be used to make both biomass pellets and feed pellets. All you have to do is simply change the die and the rollers, which also reduces abrasion of the pellet machine. 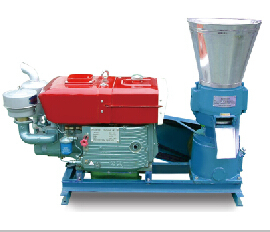 First of all, grind the raw materials into powders that are small enough, usually with a hammer mill or crusher. Then make these powders of the raw material contain appropriate moisture, usually less than 15%. Put these powders into the feeder of the diesel engine pellet making machine, and they will fall into the area between the flat die and the rollers. Then turn the diesel pellet press on, and the rollers will compress the powders into the small holes of the flat die to form pellets. Once the pellets emerge on the other side of the flat die, a series of knives will cut them into the same predetermined length immediately. Thus fine pellets are made. To make biomass pellets, the raw materials usually are: straw, rice husks, wood chips, wood shavings, sawdust, peanut shell, bagasse, alfalfa, cotton stalk, and forest waste, etc. As for the feed pellets, raw materials are: corn, maize flour, soybeans, soybean meal, fish meal, animal acid, whey power, meat and bone meal, additives, and sweet sorghum, etc.